It is a myth and and economic factor, a magnet for tourism and cultural endowment – the Thuringian Forest. No other German federal state has as much forest as the “green heart of Germany”. But the forest got stuck between a rock and a hard place of different interests. The timber industry with its huge sawmills demands thin tree trunks – with drastic effects on agriculture and recreational value. For private forest owners the forest is just an economic factor – and not romantic spot for tourists. They fight against too many wild animals, the bark beetle and acid soils. All these factors are threats to their forest. The government cuts subsidies and skimps on qualified foresters and personnel who maintain paths, huts and signposts – in times when the forest’s condition is miserable anyway, as forest damage reports prove. Who cares about the future of the forest that is so important for Thuringia? Who watches the Thuringian forest law which stipulates a balance between forestry use, landscape preservation and tourism? Who has a vision of what the forest should look like in 100 years? 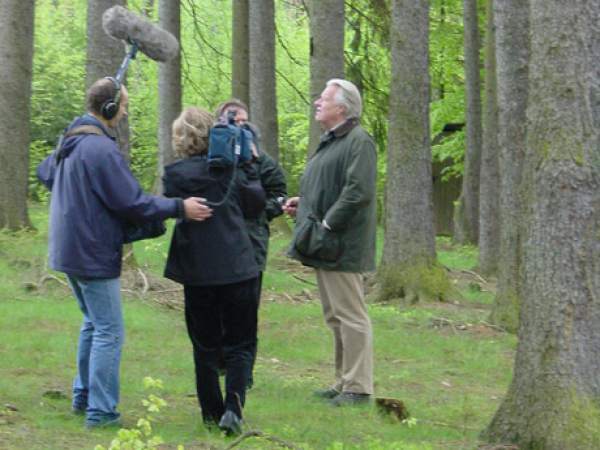 Anna Schmidt and Dirk Schneider report from the depths of the Thuringian Forest. They accompany ramblers, hunters, forest owners and forestry officers, they ask residents, public officers and politicians about the future of the “green heart”.